Hows the wireless doing for you? Any issues seen here? It kept the time even after rebooting. Anyone else seeing this after doing some configurations and then rebooting and seeing contact network activity on a external network swtich? It eventually stops after 10-15 mins I think. I didn't see this on v2.11. Happens on WiFi too. I think the DST issue is still present in v2.12. Since DST kicked off this month, I think this is when it appears. I cant get accurate time zone for my zone (MST) as it's always an hour behind. No matter what Offset I use with NTP server enabled. I didn't see this issue before DST kicked off so I presume there is a problem with DST on this model router when DST kicks off in March. I browsed a lot the forum to see the best options for the config settings firmware but I found it confusing a little bit. I'd like to know your opinion about the best config I could set for the DIR-655. First the Firmware, which version is "the best" between V2.11 and V_2.12.B01 ? From my understanding the main difference is the Exploit CVE-2014-9518 being fixed, but I'm not sure if this release has introduced new bugs or not ? Also from what I read again I understand there is some limitations in the Upload Speed under certain circumstance but it's not clear to me when ? It seem related to QoS Engine but I'm not sure about the implications with my VOIP landline ? I see also always in Forum that it'S better to set some settings like WAN speed to fixed instead of auto and I'd like to have your advice on those custom settings. The main problem with early DIR series routers was that D-Link put in a 2Mb UPLink soft cap in QoS. 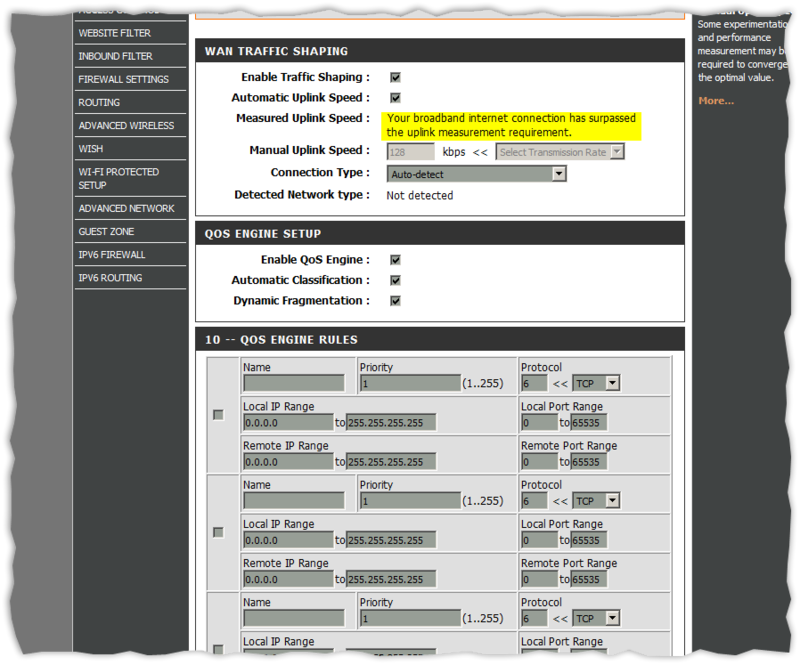 Though the QoS still works, speed testing and operation will be limited to 2Mb, even if your ISP UPLink is higher, when enabled on the router, the UPLink will be capped at 2Mb. This is seen on most early to mid model DIR series routers. Once the DIR-645 came out, they capped it a 20 or 50Mb on later models, now days I think it's up to 100Mb and maybe beyond. I think the last time I tested my Rev B was with v2.12 and didn't see much if any differences. What was this bug with 2.12B01 ? Was it a real bug ? I'm not sure I understand the signification after reading the link. Is this affect the performance, It is better to use 2.11NA or 2.12B01 is the one to have since it fix Exploit CVE-2014-9518 ? Give me some insight about it please ! Do you have a link to this CVE issue? Reason is to get more details and information from you so we have a better idea of your system and configurations. You can load v2.12 and see how it works for you, if it doesn't then you can always reload v2.11. The constant network activity was seen as far back as v2.08 and I think I was the first to observe this and post about it. I was thinking that it maybe ISP modem related possibly depending on Mfr. I only use Motorola modems so I don't know for sure. If you power up the router with out the ISP modem connected, I believe you don't see the constant activity. Only when it's connected does it happen then goes away after 10-15 minutes. It's an odd behavior. And if you still using v2.03 and the router is working well, doesn't mean you have to up grade either. Could you tell me the step to replicate the "constant activity" on DIR-655 I will try to replicate them with my modem TC4300. Does I need to make special action to make it appear ? I believe after the FW is loaded and you do a factory reset, set up the router configuration and I think set firewall SPI to end point independent and save settings which should cause a reboot, after it reboots you may see the activity kick off. Something in configuring the router and doing a reboot does this if I remember right.